Malaysian Pastry - what is so unique about it. Malaysian pastry is somewhat different from other pastry you find elsewhere in the world. However, the basic methodology to make and bake them are still the same. There are several types of pastry - short crust pastry, double crust pastry, filo pastry, puff pastry and choux pastry. Pastry involves kneading fat in flour in certain proportions. To make perfect pastry, certain knowledge in techniques and skills are required. It takes a lot of practise to make perfect Malaysian pastry. The secret of making perfect pastry lies in the coldness of all ingredients and the utensils being used, including your rolling pin, your plastic sheet for rolling and the pastry dough itself. If you use a food processor to rub in the fat and flour, remember not to over-process, because your pastry will turn out tough and rubbery because the butter will melt. Short bursts are sufficient, until the mixture resembles breadcrumbs and only then you add iced cold water to bind the dough. 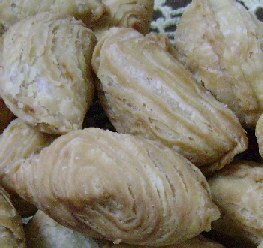 Pastry normally have fillings - sweet, savoury or spicy. They are either deep fried or baked. If you have managed to make the perfect dough and shaped the pastry beautifully, it is quite a challenge also to deep fry them perfectly. Deep fried pastry should not be full of bubbles on its skin. McDonald's apple pie, therefore, will score very low marks in my book. Malaysian pastry has evolved tremendously over the last fifty years. Three most popular pastry here are curry puff (karipap), spring roll (popiah) and pineapple tart. All three represent different kinds of pastry. These oversized karipaps have spicy potato filling. Pickled onions also made their way inside this pastry. Knowing Malaysian cooks who are always creative, karipap has many versions. 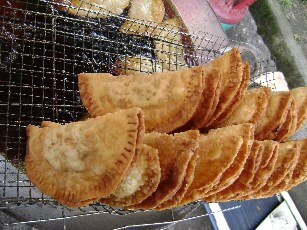 Epok-epok and karipap pusing are examples of karipap. The filling variety is also endless but the most popular is spicy curry potato with chicken or beef. Karipap falls under short crust pastry. The fat normally used is margarine but I have my own special recipe using ghee AND margarine. The way you seal the pastry is also an art form. Even though there are now karipap molds, prospective daughter-in-laws who can beautifully seal karipap are much sought after by discerning mothers. In Penang, large sized karipap are sold with a special twist - the addition of pickled onion in there. You must sink your teeth into this Malaysian pastry to understand why people rave about it. 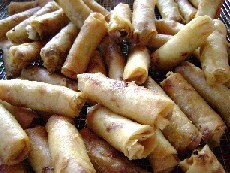 Spring rolls or popiah is the Malaysian version of filo pastry. Filo is a Greek word, meaning layers. While western filo pastry are made into strudels, eastern filo sheets are made into spring rolls and samosas. Extra crunchy fried spring rolls. The pastry normally are bought ready made, frozen in the supermarket. However, to make "popiah basah", which is a type of fresh vegetables spring roll, the pastry sheets are made fresh. It is also an art form to make these fresh popiah sheets. Spring roll sheets uses vegetable oil to make and does not follow typical pastry making routines. I have not come across non-commercial ways of making the skins just yet. At the moment, I use ready-made frozen spring rolls sheets. Spring rolls usuallly are deep fried with the exception of "popiah basah" mentioned above. My favorite fillings have the combination of minced chicken, bean sprouts, carrots, black pepper and cucumber. Aren't these very healthy? The best popiah basah in Penang is available at Brown Field (Padang Brown) which is a football pitch on the way to Dato' Keramat. The pushcart selling the popiah basah has been there since I was a toddler bouncing on my grandfather's knees. They are special because of the delicious sauce swiped on top of the rolls, and then the rolls are sprinkled with fried shallots. That is not all, a one-of-a-kind vegetable soup is also included in the package. This is definitely a unique kind of Malaysian pastry. Here is my special spring rolls recipe. Now, this is an all time favorite for everyone. Imagine, crumbly textured, melt in your mouth little baskets of pastry filled with homemade pineapple jam. Ahh, heaven! I used to eat the jam on its own when I was a kid when I thought no one was looking. Pineapple tart, no surprises here, comes in many forms also. We have traditional looking tart (little baskets with filled the jam in the middle), we have "rolled" pineapple tart, we have sliced tarts...Mmm, mmm, mmmmm! Pineapple tarts can be bought at the supermarket, mass produced by biscuits manufacturers. However, none of these instant tarts come close to those you make yourself or those baked by cottage industries entrepreneurs. During the Chinese New Year and Hari Raya, these work-at-home bakers will pull many all-nighters just to keep up with the demands for this Malaysian pastry. Here is my own version of tat nenas. Try make it yourself and see why it is popular. Karipap, spring rolls and pineapple tarts are perfect treats for your tea. They are only the tip of the iceberg of little morsels of delightful bites that you find in this country. And, I have not gone yet into other special local cakes and puddings. It would take a lifetime to taste them all. Banana is Malay traditional food, it is a nutritious and widely available. Read the full report here. Before you come to Penang to experience the local and traditional food here, check out this list of Penang Hotel here.